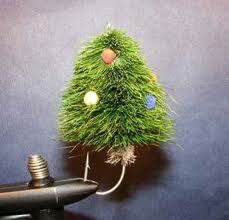 Home » Fishing News » Happy Holidays aka No Brook Trout Fishing for Months! Happy Holidays aka No Brook Trout Fishing for Months! The holiday season is here. It’s the time of year we celebrate pleasant moments with loved ones. We eat. We sing. It’s a fine time. No need to elaborate on all that good stuff. But let’s also consider what we’re stuck with. It’s winter. Cold weather. Crowded roads. The burden of holiday shopping. It’s enough to make some of us convince ourselves that cold weather fishing is fine, and to make me write something to jolt myself out of the pre-holiday funk. Winter, cold and gloomy. I can’t help comparing this time of year to the rest of it. We’ve had a real cold snap for a couple weeks now. It does get colder around here sometimes, but not much. The traffic is as bad as it gets. All the summer vacationers that had taken their traffic to faraway places are definitely here, and have become frantic wintertime mall rats. Around my office in Northern Virginia it’s an evil mess of mobile consumers snared in mall traffic, slavish robots to a manufactured holiday routine. I’ve been there this week, too, even though there is still plenty of time (Christmas Eve is still the best time to shop if you ask me). Shopping feels good but only when it’s done and my checklist has every little box ticked and I’m finally on the damn highway looking up at the stars far away from that slum. Up until that moment of escape any time spent near suburbia is misery. And fishing in pleasant weather? That’s done for sure until April. I keep reading all these great articles of people fishing for steelhead on the Olympic Peninsula, fishing for bonefish in the Bahamas, fishing for trevally in the Seychelles, fishing for redfish in the Gulf, going to Christmas Island (appropriate), going to Belize… Well, we here in Virginia have something, too. Stocked trout streams. And right now you can bounce weighted nymphs and split shot off the bottom of them in slow motion in the hopes of snagging a lethargic rainbow trout. Yeah, sounds kind of dull when put that way, but it’s alright. Better, you can pay to fish at a place like the Rose River Farm (on my list this winter), or make a trek to the Jackson River for some good tail water trout fishing if you can avoid the Kings Grant lords who won’t let you catch “their” fish. Or head up to Pennsylvania and catch some browns on a spring creek. Or maybe a blue wing olive hatch will happen on a cloudy afternoon on your local stream, and those dumb stocked fish will realize they’re edible. Wintertime actually does bring good fishing and less crowds and I make myself enjoy it. But the thing is it ain’t spring, summer or fall. If we had, say, another ten degrees of warmth, like into the forties, that would be reeeeeal gooooood. But right now… well no, I would not rather be at the mall shopping. I can’t believe I paused to think about that for a second. The real bottom line below all of this is the following: although the brook trout are probably getting done with their spawning routine they are not quite ready to be assaulted by us desperate fishermen with dry flies. Let me rewrite that: YOU SHOULD NOT FISH FOR BROOK TROUT RIGHT NOW. It’s at least another month if not two of waiting this out. Waiting and fishing for stockers. And nymphing. Good God. This season has already had enough waiting for me. Sounds like “wading” if you read it quickly and that makes me feel better. But it’s not wading, it’s WAITING. I’m sick of it. And it’s only mid-December. Part of my impatience is due to a body part that failed me a few months ago. 2010 really threw me a screwball. I had unexpected surgery on an unmentionable place in early May, right in the middle of my prime-season assault on those little brookies. I had been to Shenandoah National Park a few times already in April and caught quite a few fish. Nothing better than that except more days doing it and more fish caught. The night before my surgery I managed to catch a small catfish, about eighteen inches, from my kayak in the Shenandoah River on a black unweighted woolly bugger I tied myself. You may remember this fly tying thing is new for me this year. That catfish was a brute even on a seven weight rod, and THAT was fun. The next day I was under the knife, then nine painful days in bed, then a very slow recovery. By the time I felt mostly better, it was almost July. Fishing for brook trout in a dry summer is a challenge and can just become a massive frustration. On one of my favorite streams in Pennsylvania, over three trips this summer, I caught exactly ONE brook trout and hooked two others. Tough tough tough. I hit the Hughes River near Old Rag in early September and caught a couple small rainbows and one brook trout (a nice one, but still just one). The water was low, slow and super clear. My patience had become low and super thin. Still a great time, but not what I had hoped for. Kind of like any type of fishing sometimes. This just lasted longer and backstopped a crappy late spring. So now it’s winter, really truly winter. I’m jonesing for a long hike with a short fly rod to go for brook trout. Cannot freaking wait. Really looking forward to it. At the earliest that could be… February? Geez. Sometimes I think I started this blog at the wrong time. Once spring hits (and hopefully we can all count on enough certainty in our lives to say something like this) I will be looking for brookies everywhere I can. I not only have an entire national park nearby but I roughly know of some other streams rumored to have brook trout. Some notoriously tight-lipped people have alluded to some unfamiliar spots in a vague way as they bounced their eyebrows up and down and grinned at me. Anyway, to while away the next couple months, I will post some accounts of where and how I’ve fished this past year to keep myself entertained. Maybe you will be, too, if you’re into that sort of thing more than shopping. We’ll get pumped for a hopefully wet and warm springtime. It usually does arrive. Then, we’re after them once again.